It seems that all the people got off this flight safely. That's sort of shocking, isn't it? I write in The Survivors Club about the "myth of hopelessness." People think that all plane crashes are fatal. That's because of TWA 800 and Egypt Air and ValuJet and Pan Am 103 and all these other flight names and numbers that are emblazoned in our mind because everybody died. But in fact, if you look at the last two major incidents involving passenger jets in the United States, in Denver and now this one  I'm assuming from the CNN reporting that they think everyone is safe  but in both of the major incidents, the plane that went off the runway in Denver and this incident, you've got very, very high survival rates: 100% in Denver  with some injuries, obviously  and what looks like 100% here. People generally believe that no one survives a plane crash. But according to government data, 95.7% of the passengers involved in airplane crashes categorized as accidents actually survive. Then, if you look at the most serious plane crashes, that's a smaller number; the survival rate in the most serious kinds of accidents is 76.6%. So the point there is, when the NTSB [National Transportation Safety Board] analyzed all the airplane accidents between 1983 and 2000, 53,000 people were involved in those accidents, and 51,000 survived. That's an incredibly high survival rate. I also pay careful attention to the safety card and the safety briefing, because every plane is different. That information is part of developing a plan, and because I know that plane crashes are survivable, I want to know what the exits are, what the equipment is. I want to know what's under my seat. I actually reach under the seat with my hands and touch to make sure that my life jacket is actually there. So the safety briefings are very important. The FAA has done research on safety briefings, and they find that the least informed people, those that don't pay attention to the safety briefings, are frequent fliers. They think they know all about flying and all about planes, so they get on a flight and pick up their Wall Street Journal and start e-mailing on their BlackBerrys. I do not take my shoes off. I leave them on in the event that I need to run through a burning plane. I wear lace-up shoes. In the event of an impact, people's shoes have been known to fly off them, particularly flip-flops and other "convenient" shoes. Typically, people have a couple of pops at the bar, put on earphones; they put on blindfolds, they take off their shoes, and they go to sleep. But research has shown that the first three minutes of a plane flight and the last eight  this is called the rule of plus three/minus eight  are when about 80% of airplane accidents take place. In that time, you should not be blindfolded; you should not be drunk or have earphones on. You should really be paying attention, because you actually can survive a plane crash. See how to escape down an airplane slide. 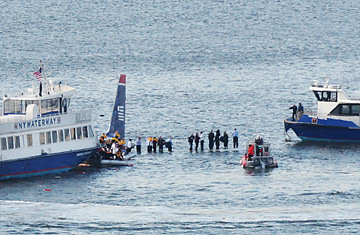 Read the 1982 TIME article about the Potomac River plane crash.